The Thompson test examines the integrity of the Achilles tendon by squeezing the calf. It is performed as a clinical test to identify the presence of a complete Achilles rupture. 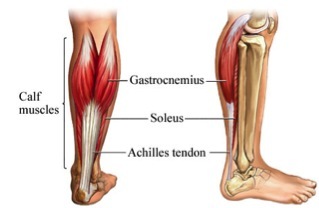 M. gastrocenium and m. soleus blend together in the distal portion of the calf and form the tendon of Achilles. The plantaris tendon, when present, lies alongside the heel cord or is somewhat removed from it in its insertion into the medial aspect of the calcaneus. Tendons are strong, tough bands of inelastic fibrous connective tissue that connect muscle to bone. They consist of elongated cells, minimal ground substance, and collagen fibers. The collagen fibers are packed closely together, parallel to the direction of force. Each collagen fibril is arranged into fascicles, which contain blood vessels and nerve fibers. The goal of this test is to find out if there is a complete tear present in the Achilles tendon. The patient lies prone with his foot over the end of the table. Alternatively, the patient could lie prone with his knee flexed to 90°. The examiner squeezes the calf muscles, specifically the gastrocnemius - soleus complex, with his hand. Squeezing the calf should cause contraction of the Achilles tendon, resulting in plantar flexion. If the Achilles tendon is completely ruptured, there will not be any apparent plantar flexion. Simmonds described in 1957 how squeezing the calf muscles could test the rupture of the Achilles tendon. Thompson however had noted this effect in 1955. The Simmonds-Thompson test is an indication for a possible complete rupture, but its mechanism is not completely clear. A study by Scott and colleagues used an ultrasound to take dynamic images of the calf of two young adults. With transverse compression, the m. gastrocnemius moved proximally, according to the ankle movement. No proximal movement of the m. soleus muscle could be seen. Thompson and Dohertyfound that the squeezing test gave a positive result when the m. soleus alone was divided. To elucidate these findings, Scott and colleagues separated the m. gastrocnemius tendon from the m. soleus down to 10 cm above the Achilles tendon, the place where the fibers form the tendon. By squeezing a healthy calf, the m. soleus deformed, which made the overlying m. gastrocnemius tendon bow away from the tibia resulting in plantar flexion. The m. soleus did not move in a longitudinal manner, while the m. gastrocnemius muscle moved about 1 cm proximally. These findings confirm the ultrasound findings. When the squeezing test was performed on a divided m. soleus tendon, the m. gastrocnemius did not produce any plantar flexion. Dividing the m. gastrocnemius tendon did not prevent full plantar flexion. We can conclude then that the plantar flexion is caused by bowing the calf tendons and less so by the proximal displacement of the bellies of the m. gastrocnemius. A study conducted by Douglas and colleagues  came up with other findings. The case study consisted of two patients who were diagnosed with a disruption of the m. gastrocnemius tendon and an intact m. soleus tendon after surgical exploration. They could both actively plantar flex their ankles, but had a positive Simmonds-Thompson test result. This study indicates that the Thompson test is insufficient as a diagnostic of a complete rupture. ↑ 1.0 1.1 Thompson TC, Doherty JH. Spontaneous rupture of tendon of Achilles: a new clinical diagnostic test. J Trauma. 1962 Mar;2:126-9. ↑ Brukner P, Khan K. Clinical Sports Medicine. 3rd ed. McGraw-Hill Book Company, 2010. ↑ Scott BW, Al Chalabi A. How the Simmonds–Thompson test works. J Bone Joint Surg Br. 1992 Mar;74(2):314-5. ↑ Douglas J, Kelly M, Blachut P. Clarification of the Simmonds-Thompson test for rupture of an Achilles tendon. Can J Surg. 2009 Jun;52(3):E40-1.